Obituary for Freeman Leroy Russell | Langeland Family Funeral Homes, Inc.
Died March 2, 2018. Mr. Russell was born in Kalamazoo, the son of Leroy and Dorothy (Teller) Russell, both deceased. 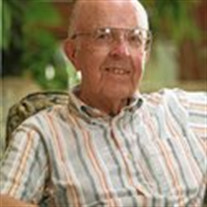 He was a resident of Portage and Kalamazoo for over 60 years. He was married to Frances (Frobenius) Russell, who is deceased. He is survived by a son Marc Russell and his wife Barbara Russell; a daughter Laurie Russell and her husband Marc Elliott; a grandson Chad Russell and his wife Sheri Russell; two great-granddaughters April and Josie Russell; a sister Mary Lou Ingham and her husband Frank. Also surviving are several nieces, nephews and cousins. He was preceded in death by a sister and brother-in-law Jean and Marvin Russell. Mr. Russell was active in scouting for many years and was an Eagle Scout. Mr. Russell graduated from Kalamazoo Central High School, Western Michigan University (B.S. & M. Edu), the Army Music School and the University of Michigan (M. Music Edu.). He was a veteran of WWII as an Air Force Bandleader and taught in the Bangor, MI Public Schools. He taught in the Portage Public Schools, was Coordinator of Secondary Student Teachers in the Portage Schools for Western Michigan University and retired from the Portage Schools as Director of Secondary Education. Mr. Russell was a former member of the Kalamazoo Symphony Orchestra, a member of Zion Lutheran Church in Kalamazoo and a founding member of St. Michael Lutheran Church in Portage. He was a charter member and past President of the Portage Rotary Club, a Paul Harris Fellow, a recipient of the Rotary Community Service Award and the Hospice Lifetime Achievement Award. Mr. Russell had also served on the boards of the Portage District Library, the Portage Community Center, was a member of the Michigan and Kalamazoo Association of Retired School Personnel and a volunteer with Hospice Care of Southwest Michigan. The family will receive friends from 5:00 to 8:00PM on Monday, March 5th at the Langeland Family Funeral Homes, Portage Chapel, 411 E. Centre Ave. The funeral service will be held at 11:00 AM on Tuesday, March 6th at Zion Lutheran Church (2122 Bronson Blvd.) with Pastor Tim Seeber officiating. Burial will be in Mt. Ever-Rest Memorial Cemetery. Memorials may be an individual choice.